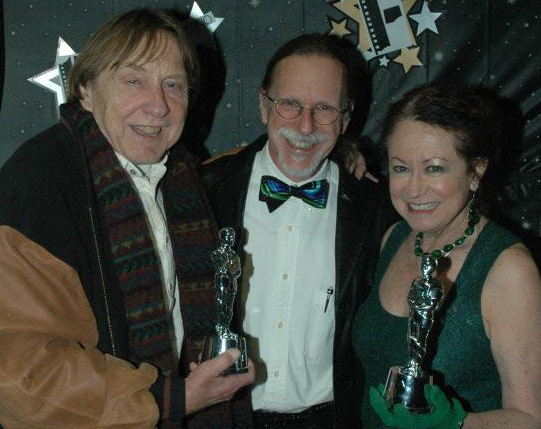 Our July 2013 volunteer of the month, Jon Veinberg, left, with Filmworks board members John Moses and Dixie Salazar at the February screening of the Oscar-Nominated Short Films 2013. Photo by Fresno Life Magazine. Occupation: Jon is a retired mental health therapist at Families First, a poet, and an occasional teacher. Filmworks thanks all of our July 2013 volunteers: Kiara Actis, Anna K. Adaska, Nené Casares, Alyssa Garvin (discussant), Katie Giometti, Margaret M. Hord, Jenna Lange, Hope Megerdichian, Susan Messina, Sarah Nixon, Kristy Page, J. Wes Pierson, Gene Richards, Susan Rogers, Brijesh Sharma, Joan Sharma, Zoë Smurr, Richard Stone, Tracy Stuntz, Jordan T. Taylor, Andrew Veihmeyer (intern), Jon Veinberg. Contact our volunteer coordinator, Gloria Burrola, to volunteer at a future screening.